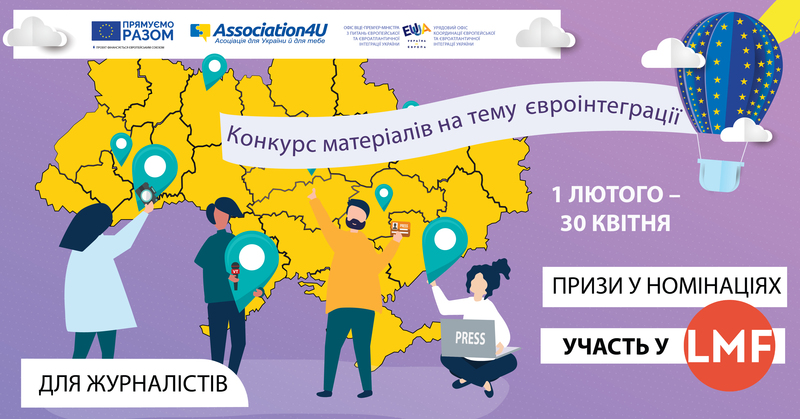 The EU’s “Association4U” project, together with the Office of the Vice Prime Minister for European and Euro-Atlantic Integration of Ukraine, has launched the third wave of the journalistic competition for the best story on European integration in regional media. The competition, entitled “Association Agreement: A Path to Changes”, will last from 1 February to 30 April 2019. Stories can be dedicated to any aspect of European integration or the implementation of the EU-Ukraine Association Agreement. The priority topics include the export of Ukrainian goods to the EU, food safety, the energy market, energy efficiency and renewable energy, digital economy development, customs reform and human rights. The winners will receive a fully funded opportunity to participate in the Lviv Media Forum 2019 and an invitation to the awards ceremony, which will be attended by the Vice Prime Minister for European and Euro-Atlantic Integration, in Kyiv in May. A detailed description of the competition participation terms can be found here. The “Support to the Implementation of the EU-Ukraine Association Agreement” (Association4U) project supports to the activities of the governmental institutions in Ukraine. Its main beneficiaries are the Government Office for Cooperation on European and Euro-Atlantic Integration, the Office of the Vice Prime Minister for European and Euro-Atlantic Integration, and line ministries involved in the implementation of the EU-Ukraine Association Agreement.